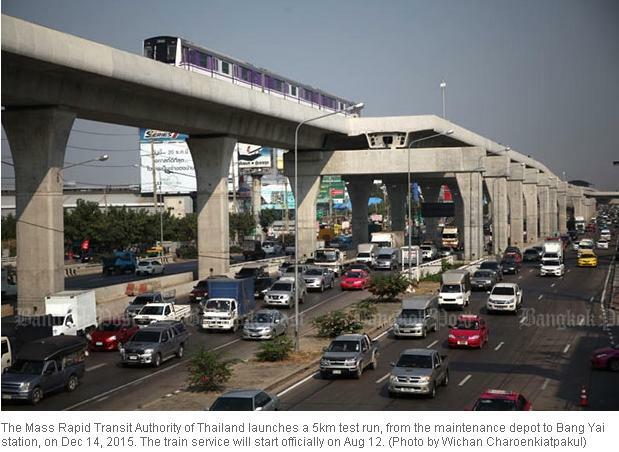 The Purple Line, the newest addition to Bangkok’s public transportation system, is set to begin operating soon and in the process should make commuting from Nonthaburi to the capital city much easier. The price for plots of land near the transit line have increased significantly with the area near the line’s terminal at Tao Pun having risen the most. Property developers hope the Purple Line will attract new buyers to areas where the train passes and are building residential projects in anticipation of demand. Of course this is more speculation than anything else and The Agency for Real Estate Affairs (AREA) president Sopon Pornchokchai told the newspaper that buyers who purchase units along the Purple Line need to be cautious. 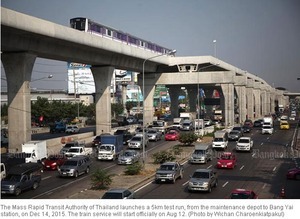 That’s because the cost of commuting is likely to be expensive as well as time consuming since reaching central Bangkok will still require a train change. And while these factors could make the locations along the Purple Line less attractive, he added that the project will urbanize the region and provide greater business potential in the long term. In the latest report from AREA, it was revealed the Purple Line from Tao Pun to Bang Yai had pushed up land prices by ten percent along the route y-o-y. Land around the Tao Pun station is most expensive and now has a market price of THB250,000 baht per sq. wah. This is a 15 percent increase y-o-y. Plots of land near Khlong Bang Phai station in Nonthaburi are the cheapest but still rose ten percent from 2014 prices. The average price per sq. wah here is THB85,000.